People rely on a lot of different information about costs to help take informed decisions. When you buy a car, for example, the list price tells you approximately how much you can expect to pay for the car itself. But the list price is only one part of the overall cost of owning a car. Other things like sales tax, the cost of insurance, expected routine maintenance costs, and the potential cost of unexpected repairs are also important to understand. Some of these costs are easily observed, and others are more difficult to assess. Similarly, when investing in funds, different variables need to be considered to evaluate how cost‑effective a strategy may be for a particular investor. Many types of costs lower the net return available to investors. One important cost is the OCF. Similar to the list price of a car, the OCF tells you a lot about what you can expect to pay for an investment strategy. Exhibit 1 helps illustrate why stated charges are important and shows how hefty charges can impact performance. This data shows that funds available to US investors with higher average charges (expense ratios) had lower rates of outperformance. For the 15-year period through 2016, only 9% of the highest-cost equity funds outperformed their benchmarks. 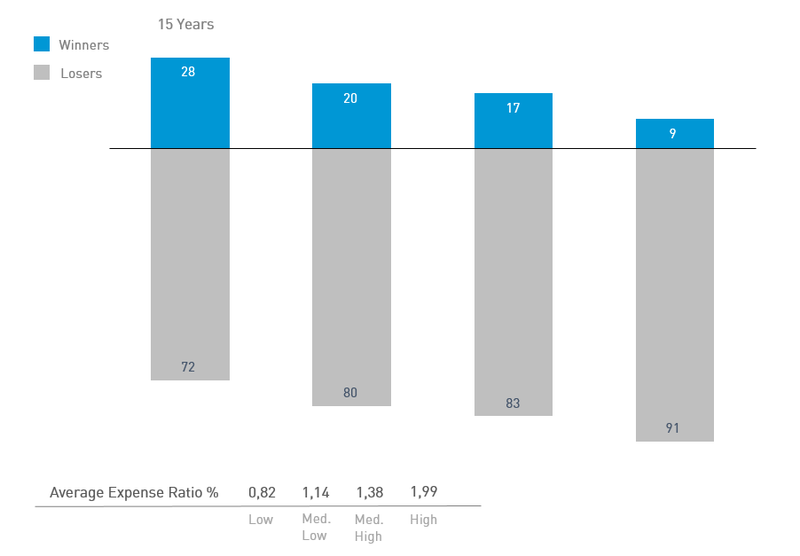 This data indicates that a high expense ratio is often a challenging hurdle for funds to overcome, especially over longer horizons. From the investor’s point of view, an expense ratio of 0.25% vs. 0.75% means savings of £5,000 per year on a £1 million account. As Exhibit 2 helps to illustrate, those pounds can really add up over longer periods. The sample includes funds at the beginning of the 15-year period ending December 31, 2016. Funds are sorted into quartiles within their category based on average expense ratio over the sample period. The chart shows the percentage of winner and loser funds by expense ratio quartile; winners are funds that survived and outperformed their respective Morningstar category benchmark, and losers are funds that either did not survive or did not outperform their respective Morningstar category benchmark. US-domiciled open-end mutual fund data is from Morningstar and Center for Research in Security Prices (CRSP) from the University of Chicago. Equity fund sample includes the Morningstar historical categories: Diversified Emerging Markets, Europe Stock, Foreign Large Blend, Foreign Large Growth, Foreign Large Value, Foreign Small/Mid Blend, Foreign Small/Mid Growth, Foreign Small/Mid Value, Japan Stock, Large Blend, Large Growth, Large Value, Mid-Cap Blend, Mid-Cap Value, Miscellaneous Region, Pacific/Asia ex-Japan Stock, Small Blend, Small Growth, Small Value, and World Stock. For additional information regarding the Morningstar historical categories, please see “The Morningstar Category Classifications” . Index funds and fund-of-funds are excluded from the sample. The return, expense ratio, and turnover for funds with multiple share classes are taken as the asset-weighted average of the individual share class observations. For additional methodology, please refer to Dimensional Fund Advisor’s brochure, The 2017 Mutual Fund Landscape. Past performance is no guarantee of future results. For illustrative purposes only and not representative of an actual investment. 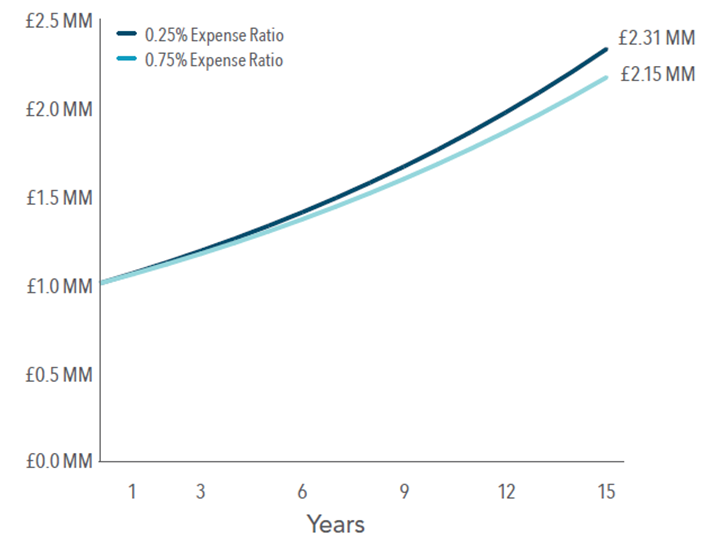 This hypothetical illustration is intended to show the potential impact of higher expense ratios and does not represent any investor’s actual experience. Assumes a starting account balance of £1,000,000 and a 6% compound annual growth rate less expense ratios of 0.25% and 0.75% applied over a 15-year time horizon. Taxes and other potential costs are not reflected. Actual results may vary significantly. Changing the assumptions would result in different outcomes. For example, the savings and difference between the ending account balances would be lower if the starting investment amount was lower. While the OCF is an important piece of information for an investor to evaluate, what matters most when gauging the true cost‑effectiveness of an investment strategy is the “total cost of ownership.” Similar to the car example, total cost of ownership is more holistic than any one figure. It looks at things that are readily observable, like the OCF, but also at things that are more difficult to assess, like trading costs and tax impact. It is important for investors to be aware of these and other costs and to realise that an OCF, while useful, is not an all‑inclusive metric for total cost of ownership. For example, while an OCF includes the fund’s investment management fee and expenses for fund accounting and shareholder reporting (among other items), it doesn’t include the potentially substantial cost of trading securities within the fund. Overall trading costs are a function of the amount of trading, or turnover, and the cost of each trade. If a manager trades excessively, costs like commissions and the price impact from trading can eat away at returns. Viewed through the lens of our car analogy, this impact is similar to excessively jamming your brakes or accelerating quickly. By regularly demanding immediacy like this when it may not be necessary, the more wear and tear your car is likely to experience and the more fuel you will end up using. These actions can increase your total cost of ownership. Additionally, excessive trading can also lead to negative tax consequences for the fund, which can increase the cost of ownership for investors holding funds in taxable accounts. The best way to try to decrease the impact of trading costs is for funds to avoid trading excessively and pay close attention to effectively minimising cost per trade. Employing a flexible investment approach that reduces the need for immediacy, thereby enabling opportunistic execution, is one way to potentially help accomplish this goal. Keeping turnover low, remaining flexible, and transacting only when the potential benefits of a trade outweigh the costs can help keep overall trading costs down and help reduce the total cost of ownership. The UK regulator recognises this point and recently called on the investment management industry to move towards a greater transparency of the total cost of ownership. The total cost of ownership of a fund can be difficult to assess and requires a thorough understanding of costs beyond what an expense ratio can tell investors on its own. A good adviser can help investors look beyond any one cost metric and instead evaluate the total cost of ownership of an investment program—and ultimately help clients decide if a given strategy is right for them.